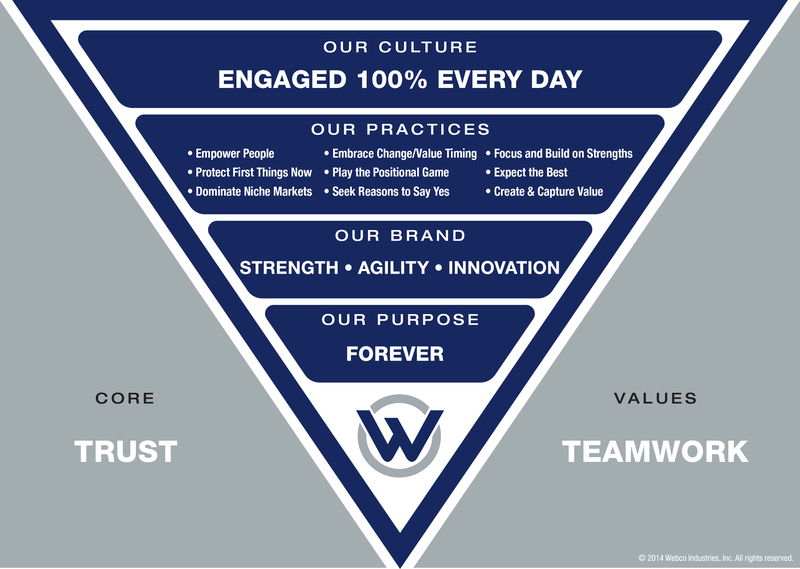 There are three foundational principles that establish an environment that allows us to foster a culture of 100% Engagement and deliver on our brand promise of Strength, Agility, and Innovation. The first of these foundational principles, Forever, speaks to the original idea of creating a company for the ages. Forever means that the strategies we develop, the decisions we make, and the actions we take should be focused on what’s in the best long-term interest of our customers, partners, communities, and employees. We make committed investments in people, products, plants, and markets that are long-term and forever-focused. Trust and Teamwork are Webco’s two other foundational principles. Trust and Teamwork create an environment that allows Webco to respond to opportunities and threats with the necessary speed to react to a world that is always changing. These two core values are critical in sustaining an organization where people make the difference. As Webco continues to grow to meet the needs of our customers and markets, Trust and Teamwork ensures we have the Strength to thrive while facing ever-evolving challenges. Webco has identified nine practices that round out our sixteen principles. From Empowering Our People to Expecting The Best, these practices guide us in the daily decisions we make as we strive to create more value for our customers, partners, and employees. You see them all listed in our inverted pyramid, and you will experience them every time you interact with Webco’s people or products.